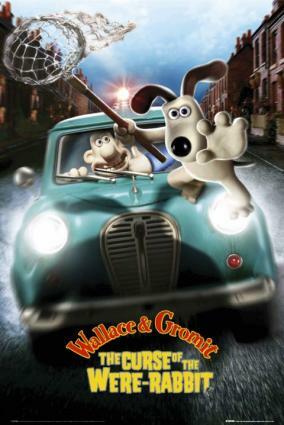 Released in 2005, Wallace and Gromit: Curse of the Were-Rabbit is a modern-day mad-scientist story animated with superb Claymation effects -- it is one of the rare family movies that everyone will enjoy.Will Wallace and Gromit save the town's produce from a marauding fiend, or will they fall victim to the Were-Rabbit? Wallace and Gromit have a very successful business protecting local gardeners' garden produce from local pests. And many of the locals especially like them because they don't just kill the little blighters; they are humane in their dealings with the vermin. Their services are especially in demand because there is a gardening festival coming, with a fabulous and highly-coveted first prize. And then one day, Lady Tottington calls and asks them to protect her home and grounds, for not only is she an avid gardener, but her grounds are to be the site of the festival -- and she has a dreadful infestation of rabbits. Wallace and Gromit are inveterate inventors, and Wallace has invented a gadget that he hopes will help alter people's behaviour by changing their thought patterns. One night, while experimenting to see if he can change rabbits' thought patterns so that they will no longer wish to eat vegtables, a terrible accident occurs, and Wallace is mind-melded with one of the rabbits he's experimenting on. They name that rabbit Hutch and put it in solitary confinement. Suddenly, Anti-Pesto cannot keep up with the marauding in people's gardens in the night. And some people are reporting a monster in their gardens, chewing up their produce. And Lady Tottington is coming on strong -- she shows Wallace her secret garden and makes it clear that she finds him quite attractive. But Lady Tottington has an admirer, Victor, who dotes on killing, and who is not happy to find the affections of the Lady being distracted. One evening, Victor hijacks Wallace to teach him a lesson. And while he's preparing to fight with Wallace over the Lady, Wallace suddenly begins to change. Before the horrified eyes of Victor and Gromit, Wallace becomes a giant rabbit -- Wallace is the Were-Rabbit. 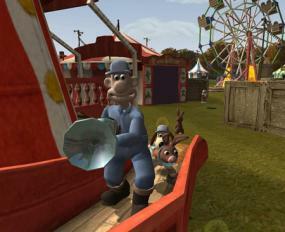 Now Gromit must find a way to save Wallace from Victor's murderous intent and protect the community's vegetables. The next morning, Gromit shows Wallace that he still has rabbit ears, and that Hutch is starting to talk and eat like Wallace. Wallace is horrified and they immediately begin to take steps to reverse the mind-meld, but it's too late. The curse of the were-rabbit is now at its peak. The murderous Victor has gotten Lady Tottington's permission to shoot the Were-Rabbit, and he's quite determined to kill Wallace. He finds out from the vicar that he must kill it with a gold bullet (24 "carrot"), and sets a trap to catch the monster at the competition. Of course, the Were-Rabbit heads directly for the vegetable show that night, and Victor is there. Gromit is on his way to protect Wallace, and makes it just in the nick of time. After an intense struggle that ranges over the entire competition grounds, Gromit finally saves Wallace and defeats Victor. And then Wallace saves Gromit's life as they fall from the top of the Lady's manor. As Wallace dies in Gromit's arms, the thought-waves that caused him to turn into a rabbit dissipate, and he turns back into himself. The curse of the were-rabbit is broken ... but Wallace is dead. It is only when Hutch mentions how wonderful the cheese is that Gromit thinks of a way to restore Wallace to life -- he holds a bit of fragrant cheese under Wallace's nose, and Wallace returns to life, his normal self. Overjoyed by Wallace's return to life and by the destruction of Victor, Lady Tottington decides to turn her manor's grounds into a sanctuary for rabbits, and she invites Wallace to come and visit whenever he can. He tells her that there will always be a bit of him at Tottington Hall, and out pops Hutch, ready to live in the wild ... though he still has his craving for cheese. All's well that ends well and Wallace and Gromit: Curse of the Were-Rabbit ends quite happily.